The most common concern readers express to me in my inbox is that they want to figure out how to prepare for the possibility of a stock market crash or prolonged bear market. It’s a reasonable concern, given how the United States has enjoyed 9 continuous years of economic expansion, we have significant government deficits, and the stock market currently has rather high stock valuations. The last stock market crash in the United States, back in 2008, caused the S&P 500 to lose over 55% of its value within 18 months. This data-driven guide provides an overview of what causes stock market crashes and shows several simple and advanced approaches to protect your portfolio from a major bear market. There’s no single answer, no silver bullet, that can fully protect your money from everything. However, there is a mix of basic strategies that can make your portfolio quite resilient through all market conditions. What Causes a Stock Market Crash? A stock market crash is a sharp and broad drop in a stock index, like the S&P 500 index for example. There’s no official definition of what a crash is, but if a double-digit decline happens within a couple days or weeks, it’s generally considered a crash. A bear market is more broadly defined as a 20% or more decline in a major stock index from a recent peak, regardless of how sharp or gradual that decline is. The bear market remains until stocks recover and surpass the previous peak, which can take months or years. Most economies go through what is called the business cycle or the economic cycle. This existed before central banks, but central banks now play a major part in it as well. It’s the wave-like nature of how economies grow and debt cycles develop. On top of that, there’s the herd-like psychology of the stock market, which tends to magnify the booms and busts of the business cycle. It’s important to note that a stock market decline usually precedes a recession. In other words, the stock market typically hits a peak and begins declining several months before a recession officially begins. That’s why on the chart above, the stock market cycle (in blue) is shifted ahead of the economic/business cycle (in yellow). The official start of the 2007 recession was in December of 2007, but the S&P 500 peaked in October 2007 and declined thereafter. The official start of the 2001 recession was in March 2001, but the S&P 500 peaked six months earlier, around September 2000. 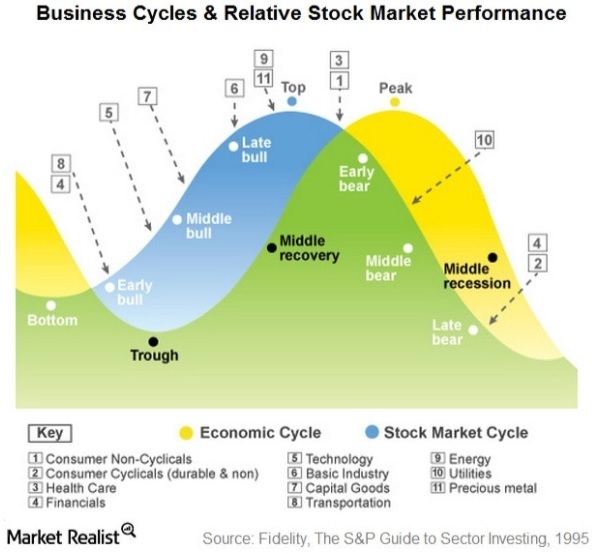 Every modern business cycle is different, but most of them share a common pattern. A key part of the pattern to be aware of is interest rates. Using the U.S. Federal Reserve as an example, they have two key goals, called their Dual Mandate. Their two goals are to maximize employment and keep inflation at around 2% per year. Their main way to maximize employment is to lower key interest rates, which reduces the interest rates of mortgages, corporate bonds, and all sorts of debt. It also reduces interest rates in bank savings accounts. This encourages consumers to go ahead and take out a cheap mortgage to buy a house, and to take money out of low-interest savings accounts and buy stocks and other risk assets. It also entices businesses to go ahead and issue some new bonds/debt to expand their business. Basically, low interest rates entice people and companies to consume and invest, which is good for the economy. However, when consumers and companies borrow a lot of money and spend a lot of money, it often starts to create price inflation. When price inflation starts to come around, the bank’s main way to reduce inflation is to raise interest rates. This makes mortgages, bonds, and all sorts of debt more expensive. It also increases the interest rates that bank savings accounts give. Higher interest rates make saving more money in zero-risk bank accounts desirable. It also means companies are less likely to issue new debt to expand, and consumers are less likely to buy a house or other major purchase. This generally lowers price inflation. The 1970’s/1980’s had unusually high inflation, and thus the central bank had high interest rates to keep that in check. So we see this big multi-decade super-cycle that peaked in the early 1980’s. But besides that, you can see on the chart that the Fed consistently raises interest rates during the white (non recession) periods. Then, right when a recession is showing signs of coming (right before or during a grey recessionary period), the Fed reduces interest rates. After a prior recession, the first step of a business cycle is a recovery. Surviving businesses already hunkered down and survived the recession, which means they likely deleveraged and protected themselves. With high unemployment levels, consumers on average don’t have a ton of spending money, and companies are giving all sorts of discounts, special deals, and low prices to try to attract customers. Inflation therefore tends to be low, because neither wages or prices are growing. At this point, the country’s central bank is accomodative, which means its interest rates are very low. They don’t have to worry about inflation right now, and want to improve employment levels. Slowly but surely, consumers and businesses start taking advantage of low interest rates to buy real estate, expand their businesses, etc. Stock prices tend to be cheap, and smart investors are buying stocks aggressively. During a normal period, in the middle of the cycle, the economy is doing okay. Unemployment is reasonably low, and businesses are doing fine. 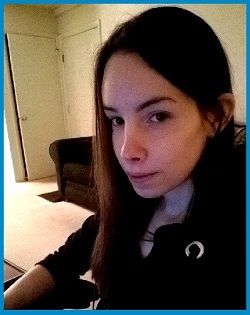 Not spectacular, but quite alright. Consumers and companies have been growing their debt levels a bit, and that expanding debt is allowing for more purchases and more economic growth. The central bank at this point likely raised interest rates a little bit, but still has them fairly low. Stock prices are still quite reasonable, and smart investors are still buying. As the business cycle continues, and real estate prices and stock prices have kept going up for years, people start to get greedy. Consumers take out too much debt to buy bigger homes. Investors take out a lot of margin debt to buy more stocks. Businesses have higher debt levels as well. They are issuing debt to expand their business, perform share buybacks, buy other companies, etc. Stock prices become too high, because there’s so much enthusiasm, and many people think this period of growth will last forever. Smart investors start becoming cautious about stocks. Price inflation starts to creep up, so the central bank begins raising interest rates further to keep inflation in check. This makes consumers hold more money in savings accounts, because they provide decent interest rates now. Disciplined consumers are spending less and saving more. Less disciplined consumers become too indebted, and the interest rates on their debt are getting too high, so they stop buying things and some of them start defaulting on their debt. Because consumers aren’t buying things as much, businesses start to see lower revenues and profits, which is a big problem because they also have a lot of debt that they have to pay back. Some companies start to collapse, and either go bankrupt or get acquired by a stronger, smarter business. People start panicking and selling their overpriced stocks. There is often a stock market crash, or a severe bear market. People feel poorer because their retirement accounts, brokerage accounts, all have less value in them. Their home prices start to fall. Many people spend less money because their net worth (real estate and stocks) is shrinking. This all creates a vicious cycle, because companies start laying people off, and unemployment increases. Unemployed people can’t pay their debts as easily, and can’t buy as many things, so business profits are hurt further, and more businesses go bankrupt. More people lose their jobs. The central bank reduces interest rates to try to encourage borrowing and investment. After the darkest, deepest parts of the recession, some bold businesses begin making investments, taking advantage of bankrupt competitors and cheap interest rates, and hire some people to expand. Smart consumers realize it’s time to buy an undervalued house or undervalued stocks, and take advantage of cheap mortgages and other loans. And the cycle begins anew, in the recovery phase once again. Sometimes, there is a bigger bubble in stocks than in real estate, like what happened in the year 2000. Other times, there is a bigger bubble in real estate than in stocks, like in 2007. Occasionally, there is high inflation and a recession, like in the 1970’s in the United States. This is really hard for a central bank because they want low interest rates to encourage economic expansion, but need high interest rates to reduce inflation. Sometimes there is a specific area where there is way too much debt. This could be the government, could be the corporate sector, or could be consumers. The key thing to realize is that the debt cycle plays the main role in the business cycle. When debt and interest rates are low, consumers and businesses start buying and expanding, which results in economic growth. When that goes on for a while and debt and interest rates get too high, consumers and businesses run into problems, which results in recessions and bear markets. There may or may not be a specific event that causes a stock market crash at the end of the bubble phase. Often, stock valuations just get too high, and some investors stop buying and start selling. Then someone else sees this and sells too. Then everyone starts selling. Sometimes, simplicity is the best approach. In short, make sure your portfolio is diversified among asset classes and regions, re-balance regularly, and maintain a high savings rate with low leverage. Don’t panic and sell stocks after a stock market crash, don’t get over-leveraged in mortgages or margin during bull markets, and occasionally take a step back and examine the big picture to make sure you’re on the right track. Diversifying a portfolio into several asset classes and re-balancing annually or more regularly historically gives investors strong investment returns over time. The S&P 500 took about four-and-a-half years to recover from its previous peak in 2007. However, a mix of 60% stocks and 40% bonds took only three years to recover, and had a much less severe crash. And if you had an income and continued investing like clockwork each month, your net worth would recover even more quickly, likely within a year or two depending on how big your portfolio is compared to your income. In addition to the traditional stock/bond split, you can also diversify into international stocks to further reduce the probability of major portfolio declines. 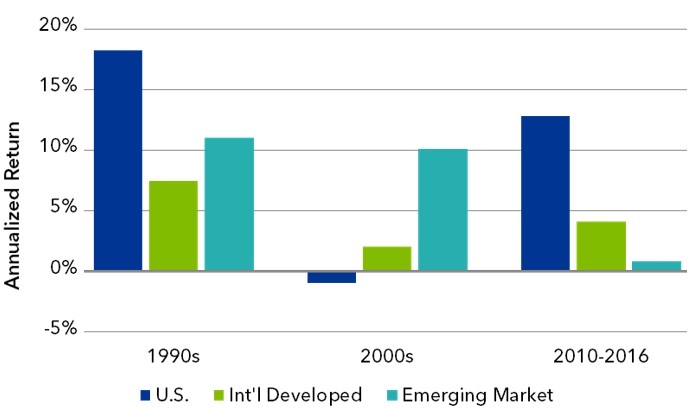 In terms of numbers, Ben Carlson of Ritholtz Wealth Management found that hypothetical investors who would have invested equally in the United States, Europe, and Asia Pacific from 1970 to 2014 and re-balanced occasionally had better returns (10.6% annualized) and lower volatility than any of the three markets provided independently. Other potential asset classes besides domestic stocks, foreign stocks, and bonds, are: precious metals, real estate, commodity producers, and more. Certain asset classes often go up while stocks go down. For most people, it pays to not have a portfolio that is too concentrated. There’s something to be said for concentrating into high-conviction assets for people that seriously know the companies they are invested in. There are a few companies I have quite a bit of money in, for example. But it’s important to be diversified appropriately for your time horizon and risk tolerance. After a stock market crash, most investors make it far worse for themselves because they sell their stocks after the market decline, deep in the bear market, which means they never benefit from an eventual recovery in prices. Rather than selling stocks after they fall, you should usually be buying. It doesn’t need to involve market timing, since it can be done automatically with re-balancing. When stocks go up, they will be a bigger part of your portfolio. You can sell some stocks to buy bonds or other asset classes to get back to your target allocation, or you can focus on directing new income to those other asset classes. Conversely, when stocks fall, they will naturally be a smaller portion of your portfolio, while bonds and certain other asset classes may have retained their value. Then, you can sell some of those asset classes to buy enough stocks to get back to your target allocation. There are many ways to invest successfully, but buying into a diversified low-cost portfolio with exposure to several asset classes, and re-balancing occasionally, is one of the simplest and most effective strategies over the long-term for the majority of investors. Disciplined portfolio management and proper asset allocation are together only half the equation for preserving wealth through a stock market crash or bear market. The other half is more about personal finance. When you’re enjoying a bull market and it’s been several years since the previous recession, that’s when you should be beginning to prepare for the next downturn. Once the downturn hits, it’s already too late. This is what separate smart consumers and businesses from average ones; they are cautious when others are greedy, and opportunistic when others are fearful. For example, most people in the working class, middle class, or above should be saving at least 20% of their income and investing much of it. When the economy is strong, focus on building your wealth, paying down debt, and making your financial situation rock solid. That way when a downturn comes, you’re prepared. You can ride through the worst of it. For more enterprising investors, once the stock market crash or bear market hits, you could even take on some leverage to buy distressed assets, like a rental property or undervalued stocks, if you were prepared ahead of time with a very strong balance sheet back when everything was expensive. The main thing to keep in mind is that your baseline necessary expenses (housing, transportation, food, healthcare) should be well below your income. If you have a two-income household, try to keep your housing and overall financial situation modest enough that one income could support it if absolutely necessary. For a lot of those stories you hear about people losing their houses and 401(k)s during recessions, it’s often because they were over-leveraged with low savings to begin with. Or they sold all their stocks after their stocks lost value, and therefore never recovered when stock prices recovered. Stay smart, stay diversified, and try to do the opposite of what most people are doing at any given time. 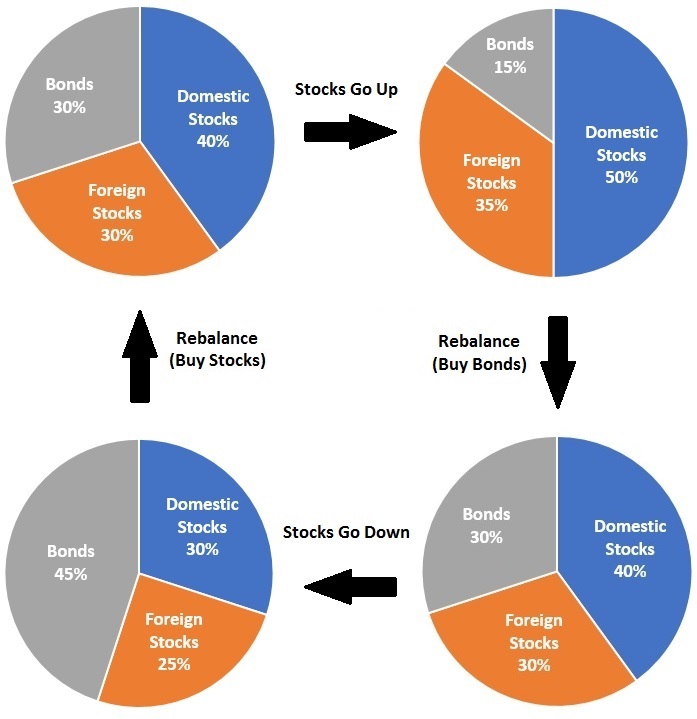 Most investors should stick to a diversified, regularly re-balanced portfolio described above. However, some people are more interested in being hands-on with their portfolio. In addition, there are some market events that are quite difficult to recover from if you don’t dodge them ahead of time. The example earlier in this article of the 2008 financial crisis showed that the S&P 500 took about 4.5 years to recover to its pre-crisis peak. However, it took about 7 years for the S&P 500 to recover after the 2000 Dotcom bubble crash, or 15 years on an inflation-adjusted basis. Going back further, it took almost 11 years, with the exception of a few brief spikes, for the S&P 500 to comfortably re-gain its previous high after the 1969 bear market. On an inflation-adjusted basis, it took 23 years (all the way until the early 1990’s). Biggest of all, it took an astounding 24 years, or 27 years on an inflation-adjusted basis, for the S&P 500 to recover and surpass its previous highs after the 1929 stock market crash. These were a bit less severe when you include reinvested dividends. The S&P 500 has never quite gone 20 years without positive returns with reinvested dividends included. But still, it can go for quite a long time with negative returns, especially in terms of inflation-adjusted purchasing power. At minimum, this underscores the importance of international diversification and proper asset allocation. Investing 100% of your portfolio into the stock market of your home country exposes you to the real possibility of a multi-decade bear market. Having some global assets reduces your exposure to this type of outlier event. More broadly, it shows how occasional use of more advanced tactics can help you sidestep some of these once-a-generation crashes. Tactical asset allocation is an investment approach in which you adjust your asset allocation to take advantage of unusually cheap or expensive assets. In other words, you don’t just re-balance to the same exact asset allocation percentages each time; you adjust your asset allocation percentages based on market conditions. If U.S. stocks are unusually expensive, you reduce your exposure a bit. If emerging markets are oddly inexpensive, you buy a bit extra. That sort of thing. It helps avoid major stock market crashes, because you’ll be holding less stocks if they’re unreasonably expensive. Even Jack Bogle himself, founder of Vanguard and one of the earliest proponents of buy-and-hold index investing, sidestepped much of the Dotcom bubble in his personal portfolio and has spoken about this before. He noticed, correctly, that the S&P was utterly, ridiculously, overvalued, while bonds were reasonably-priced. So, he actively reduced his equity exposure substantially, especially because at his advanced age he wanted to avoid a major stock market crash. As one example, Meb Faber, the CFO of Cambria Investment Management, is well-known for his Ivy Portfolio Timing Model. This model portfolio invests 20% in U.S. stocks, 20% in international stocks, 20% in REITs, 20% in commodities, and 20% in U.S. Treasuries. If any of those assets fall below their 10-month moving average, the model portfolio sells that particular asset class and goes to cash. When that asset class is above its 10-month moving average again, it re-buys into that asset class. While it’s not a perfect model, it would have sidestepped the major declines of the Dotcom stock market crash and the 2008 financial crisis, and would have mildly outperformed the S&P 500 with less volatility over a multi-decade period. I have a more casual, gradual and long-term approach based on minimizing taxes and fees, and focusing on fundamental valuation. I keep track of fundamental valuation differences between asset classes (CAPE ratio, market-cap-to-GDP ratio, price-to-book, price-to-sales, price-to-earnings, dividend yield), and then I mildly overweight areas that seem to offer better overall values compared to other asset classes. This generally means taking a contrarian approach, and buying out-of-favor asset classes or companies that are cheap. This includes U.S. stocks, foreign stock ETFs, REITs, bonds, precious metals, and occasionally commodities. In addition, I monitor the business cycle, including paying attention to interest rates, debt-cycles, and various recession indicators. I rarely make major portfolio moves, and instead just dial my asset allocation around gradually based on market conditions. Investors that focus on building passive investment income, by buying dividend stocks, REITs, and other income-producing investments, tend to weather bear markets quite well. Dividend income is a lot more stable than stock prices. And the S&P 500 isn’t even optimized for dividends. Some companies in the index don’t pay dividends at all, while others pay them inconsistently. 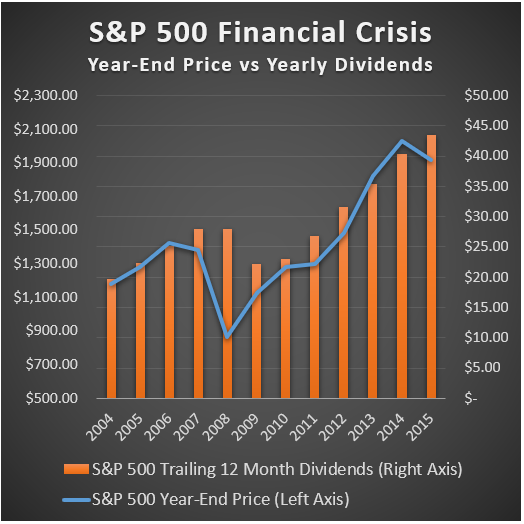 Despite this, dividend income of the S&P 500 is a lot more reliable than S&P 500 stock prices. 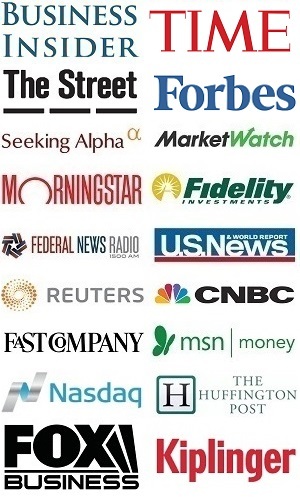 Better than this, investors that focused specifically on dividend growth stocks, meaning stocks that have 10+ years of consecutive annual dividend growth, strong balance sheets, and reasonable dividend payout ratios, minimized or avoided any disruption of their overall dividend income throughout the crisis. Specifically, investors should look for companies that continued increasing their dividend during previous recessions. Focusing on investing in companies with a decent dividend yield and low dividend payout ratio also helps you avoid substantially overvalued stocks during a bubble. In addition, during a prolonged sideways bear market, having a substantial income yield lets your portfolio earn decent returns even if stock prices remain relatively flat. While this won’t do a ton to help during a stock market crash, it’s a tactic that benefits from volatility and prolonged bear markets. You can sell cash-secured put options or covered-call options to generate substantial investment income even during flat or mildly bearish markets. In an environment like that Nikkei 225 chart above, it has been a multi-decade bad period for buy-and-hold stock investors, but people generating income from high-yield stocks or options strategies have done a lot better. This is like buying insurance. You pay a bit of money regularly, but get a big payout if something bad happens. When you own a put option, you have the right to sell a stock or ETF at an agreed-upon price before an agreed-upon expiration date. Right now, for example, the S&P 500 ETF (ticker: SPY) is at about $290. You could buy a put option for about $4/share, which lets you sell SPY at $280 any time within the next three months. If the SPY ETF were to crash by 25% from $290 to $217 two months from now, you would be able to sell SPY at $280, which is way higher than $217. In fact, you could sell that option to someone else, which would be worth $73/share ($280 – $217). In this event, the $4/share put option would be worth $73/share a couple months later. That’s a nice hedge to protect a portfolio from a severe crash. Even if there’s only a 10% stock market correction for SPY from $290 to $261, the put option would go from $4/share to $19/share. However, the problem in practice is that most put options will expire worthless, because stock market crashes are rare. You’ll pay $4/share for put options, SPY will go up or stay flat, and in 3 months your put options will expire. Then you’ll pay another $4/share or so, SPY will keep going up or stay flat, and that option will expire too. You’ll keep wasting money on expired put options (like spending insurance premiums), and it will drag down your returns during bull markets. Then during a bear market, you might get a nice payout when one of your recent round of put options finally becomes valuable, but it might not make up for all the expired put options you already paid for, depending on how long you’ve been doing it. Frankly, most people shouldn’t really bother with this, because they will lose more money with expired put options than they will make from their eventual profitable put options. An alternative is that you can buy an inverse ETF, like the ProShares Short S&P 500 ETF (ticker: SH). This will go up when the S&P 500 goes down, and will go down when the S&P 500 goes up. Again, more often than not this type of ETF will lose value over time, because stock markets go up a lot more than they go down. But for enterprising investors that spot a bubble, a small position in an ETF like that as a hedge at the right time can be lucrative. Basically, you need to be contrarian for this to be profitable over time. I’m not using this approach currently, but may use a small hedge in certain market conditions. In summary, there are both simple and complex methods to protect your capital during a stock market crash or prolonged bear market. Maintain a high savings rate, and live below your means during prosperous times. Always be prepared. Diversify your portfolio among several asset classes and geographic regions. This usually improves risk-adjusted returns. Re-balance your portfolio regularly, and don’t follow the herd. Don’t panic-sell stocks after a crash, or euphoria-buy stocks after a long bull market. Consider occasional active tactical moves to sidestep unusually large bubbles. This could mean, for example, trimming equity allocations during rare periods of extreme overvaluation. Then there are some specific approaches, like using hedging strategies, focusing on dividend stocks, or employing timing models to try to optimize returns or reduce volatility. A focus on dividend growth stocks is good for most investors, while some of these other strategies are more advanced. However, always be mindful of how these approaches affect fees and taxes, and consider what shortcomings they may have. Remember, most professional active managers under-perform index funds net of fees. Trading too frequently, or being too active with your portfolio, is more likely to reduce returns than improve returns. Overall, balance is key. Don’t be a perma-bear, but be aware of the business cycle and things that could damage your wealth.